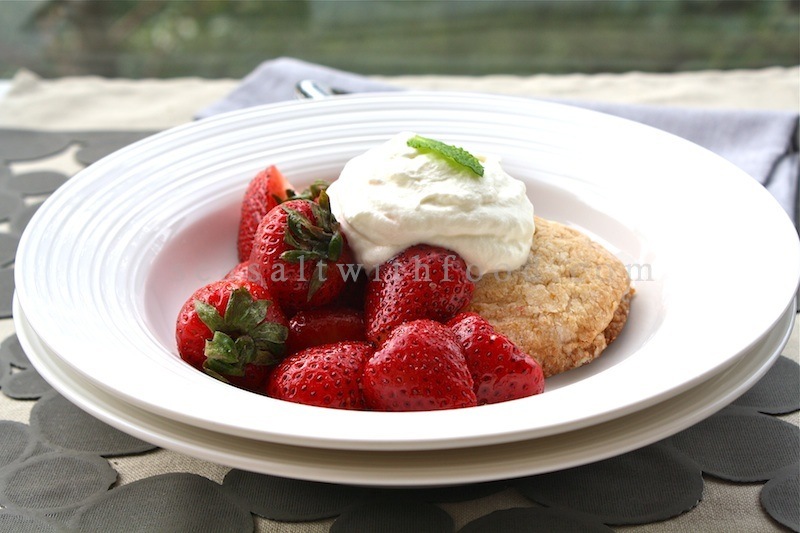 This is a sweet and salty Strawberry shortcakes recipe that I had adapted from the Momofuku’s cookbook. I just did a minor tweak to the recipe. I used 1 tsp instead of 1 Tbsp of salt to the mixture. A good decision as the shortcakes turned out perfect, with the right amount of saltiness and was just great with the macerated strawberries and whipped cream. Add the beaten egg into a small measuring cup and spoon off half of it. (Reserved for other use or discard them) Add enough heavy cream to the egg to make ½ cup. Stir briefly, and then put the mixture in the refrigerator to chill. Combine the flour, granulated sugar, brown sugar, salt, and baking powder in the bowl of a stand mixer outfitted with the paddle attachment and stir them together. Add the butter and shortening and turn the mixer on its lowest setting. Mix the fat in until the batter is gravelly, with pea-sized lumps everywhere, which shouldn’t take much more than 4 minutes. Once you have got grainy short batter together, grab the cream mixture from the refrigerator and stream it into the batter, stirring it in with the machine still on its lowest speed. Mix until the liquid is barely absorbed and let the dough rest in the mixer bowl for 10 minutes. Scoop the batter into little balls, using about 2 Tbsp for each (you can assist their shaping lightly with your hands) and line them up on a baking sheet. You should have 8 balls and chill in the refrigerator for at least 30 minutes, and as long as overnight. Heat the oven to 350˚F. Line a couple of baking sheets with parchment paper or Silpats. Pour the confectioners’ sugar into a wide shallow bowl. Roll each of the shortcakes through the sugar to coat very lightly, tap off excess, and place the dusted cakes on the prepared baking sheets, with enough room between them allow them to double their footprint while baking. the oven, bake them for another 60 to 90 seconds. Transfer to a rack and let cool. 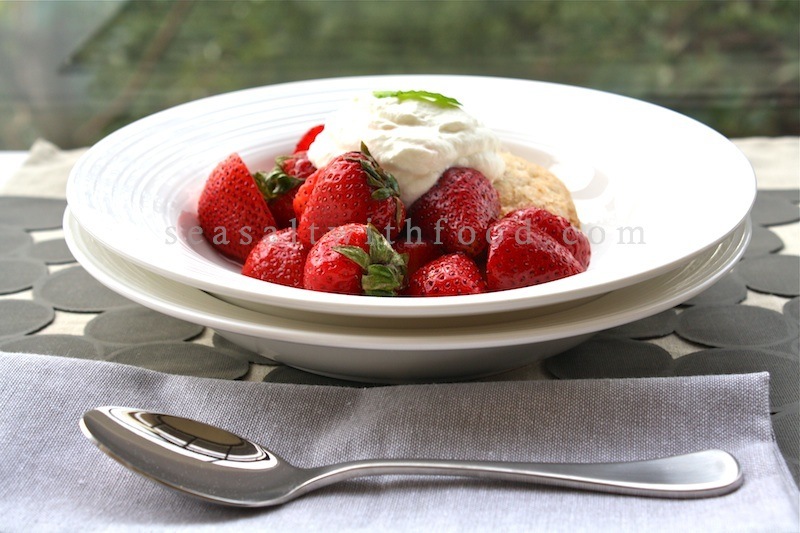 Serve with macerated strawberries and generous dollop of whipped cream. Macerated Strawberries: One or two hours before you intend to serve them, gently toss 4 cups of hulled strawberries with ¼ cup of sugar; the sugar will draw out the juices from the strawberries. Serve cold or at a room temperature, allotting about ½ cup of strawberries per serving. 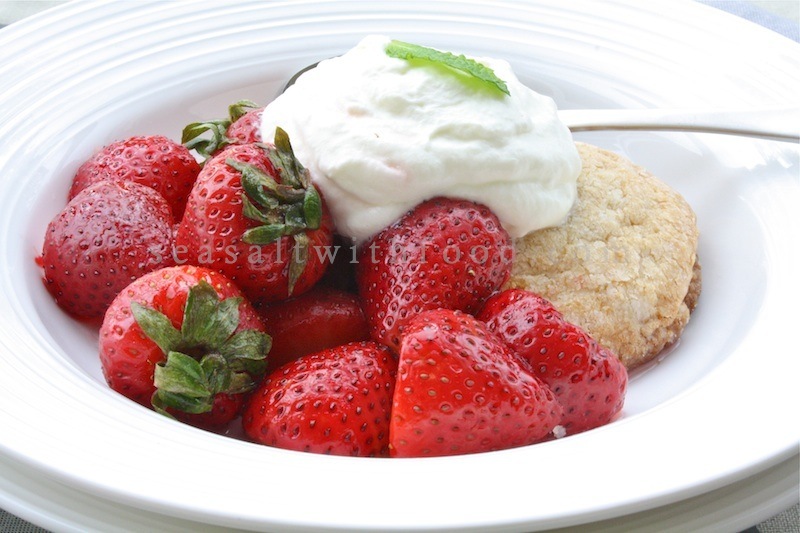 Use the macerating liquid as part of the dish-pour it over the shortcakes and strawberries. Shortcake served with whipped cream and strawberries in the spring... Who can beat that?! Just simply perfect. I love those big chunk of strawberries. Can't wait to make my own.